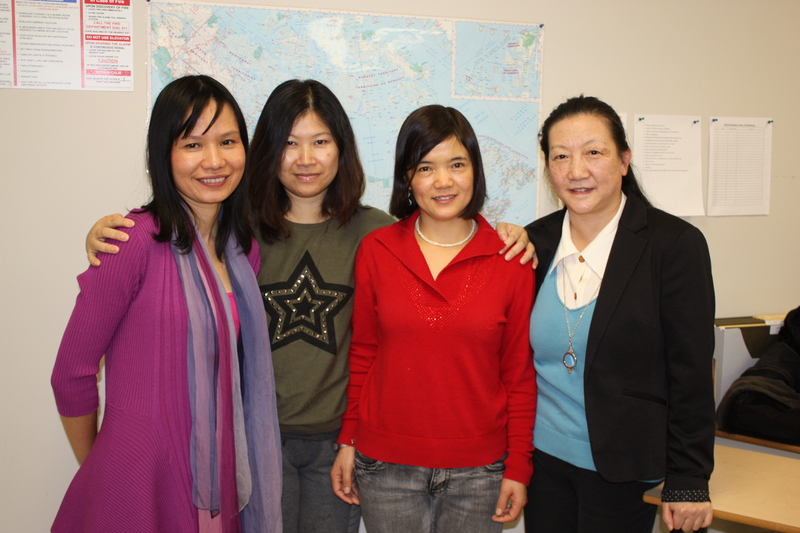 (L-R) Nhung Dinh, Xiangyu Ma, Hong Ying Dou and Jing Yang. For many Islanders Christmas and New Year’s are now in the distant past, the memories blurred by a couple of hearty snow storms and, for some, a blizzard of bills. But for Jing Yang, Xiangyu Ma, Nhung Dinh, and Hong Ying Dou, students at our Belmont Centre in Charlottetown, the biggest holiday of the year is just a few days away – the Chinese New Year. The four women are all in one of the college’s Enhanced Employability Essential Language Skills class. Jing, Xiang and Hong are all from different parts of China, Nhung is from Viet Nam, and although they share many similar traditions there are variations, too. The food that they will eat over the holidays is not just delicious, it is laden with significance. The long noodles that they will start their meals with represent long life. The fish they prepare will ensure that they always have plenty of the necessities of life, while the dumplings they will eat are shaped like money to bring them wealth. Nhung, whose husband has returned to Vietnam to celebrate the New Year, said that the family eats traditional Vietnamese rice cakes to remind them of their ancestors and their family’s history, and the house is filled with cherry blossoms and kumquats. In China, Jing said, they place food on a table set to honour their ancestors, which brings them good luck. Luck is an important aspect of the New Year celebrations. Hong Ying said that in her part of China at this time of year, people who are born under the same sign as the incoming year (this will be the Year of the Horse), must pay special attention to avoid misfortune. “If this is the year of your birth, you must wear red to avoid evil spirits and bad luck,” she explained. We pondered about that for a minute. I thought that one should expect to have a lucky year this year if you were born in the Year of the Horse, but they assured me that it was a year of potential strife for Horses. “Perhaps because you would be too proud,” Xiangyu suggested. Whereas in Hong Ying’s home town people wear as much red as possible, Jing said that where she comes from, close to Beijing, people fend off bad luck with only a strip of red cloth tied to a belt loop. New Year’s is usually between January and February, exactly when depends on the lunar calendar, and the celebrations last 15 days. Preparations started this year on December 8 with a meal of porridge. It is believed that the kitchen god will leave your home after dark on December 23 to report to a higher deity. Since you want to make sure that his report to the higher deity reflects well on you, the cooking and cleaning begins after he’s gone! Fireworks send the kitchen god to heaven, and then, on New Year’s Eve, welcome him back into your home. After the fireworks, the family eats dumplings that they made earlier in the day. While luck and good fortune are important elements in the New Year’s traditions, it is the emphasis on family, both past and present, which is most important. I wondered if Jing, Xiangyu, Nhung and Hong Ying would be homesick. Jing is visiting her daughter in Cambridge, England for the holidays; but Xiangyu, Nhung and Hong Ying agreed that although there won’t be any large celebrations here in P.E.I., being able to use social media such as QQ (a popular social media site in China, where Facebook is banned), Facebook, and Skype to connect with their families, makes it easier. All of them have children and other family members here as well, and they are looking forward to celebrating with them over the holiday. The Holland College Business Administration program welcomed 25 students from Colonel Gray’s new Academy Diploma Program in Business and Innovation for a half-day visit on November 26. The visit featured program shadowing and student presentations. The Academy Diploma Program (ADP) is a newly launched, provincially approved program that focuses on helping high school students with the transition into post-secondary education and the workplace. The program emphasizes specific, sector-related skills designed to prepare high school students to pursue their career of choice after graduation. The ADP enables students to customize their education based on talents and interests while still meeting acceptable educational standards for high school diplomas. Students are also given opportunities to job shadow and volunteer within the community to gain experience in a variety of sector-related areas. During their visit to the Business Administration program, Colonel Gray ADP students were given a program presentation from faculty, a department tour, and a presentation from second-year Business Administration students. ADP students also attended a business studies class and had lunch with current students. Pathway exploration is an important component of the ADP in Business and Innovation. Students enrolled in the program connect their learning to potential post-secondary opportunities in the business sector to help them make more informed decisions about their chosen career path. Learn more about Colonel Gray’s Academy Diploma Program in Business and Innovation here.